Madhya Pradesh Chief Minister Shivraj Singh Chouhan had Thursday announced that a directive would be issued shortly to ensure that the amended SC/ST Act is not misused in the state. Jyotiraditya Scindia made the assurance during meeting with protesters from unreserved categories. Senior Congress leader Jyotiraditya Scindia Friday assured people that no one would be implicated falsely in Scheduled Castes and Scheduled Tribes (Prevention of Atrocities) Act cases. Mr Scindia made the assurance Friday when protesters hailing from unreserved categories arrived here to register their anger at the amendments to the SC/ST Act. He, however, parried a question on making any amendments to this Act in case the Congress came to power in poll-bound MP. Talking to protesters, Mr Scindia said, "I assure you that no one will be allowed to be implicated falsely under SC/ST Act not only in Shivpuri but in the entire state." When protesters asked if the Congress, if elected to power, would introduce amendments in this Act, Mr Scindia said, "I will answer this question when the Congress will form a government." 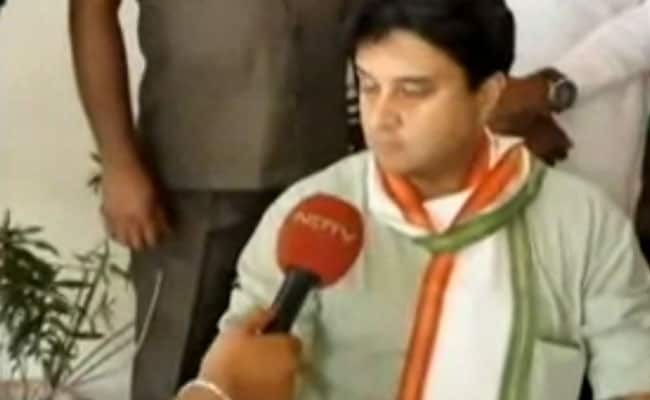 Mr Scindia is the chairman of the Congress' state election campaign committee. The protesters also asked him why he did not speak against the amendments when they were tabled in Parliament. In reply, Scindia alleged that they (Congress) were not allowed to speak in Parliament when such proposals come up for discussion. A large posse of police was present due to proposed protest organisations opposing the SC/ST Act amendments. Meanwhile, Congress workers thrashed the convener of Karni Sena, Atul Singh, after he threw a black flag towards Scindia when he was coming out after attending a programme here. Later, Singh filed a complaint with Kotwali Police Station. "We have received a complaint and investigations are on," said Kotwali police station in-charge Rakesh Sharma.